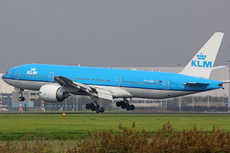 A Boeing 777-200ER, operated as KLM flight KL868 from Osaka/Kansai, Japan to Amsterdam/Schiphol, the Netherlands lost a fuselage panel (close to the right wing trailing edge) while climbing through 2400 m (about 8000 feet) over Osaka. The panel, measuring 110 cm x 107 cm and weighing 4.3 kg hit the roof of a driving car, causing a dent on the roof and cracked the right side window of the rear seat of the car. Neither of the two occupants of the car nor 321 occupants of the Boeing were injured. The flight reached the destination without further incident. JTSB launched an investigation as a serious incident. It is certain that this serious incident occurred when the departed right aft wing-to-body fairing panel struck and damaged a moving vehicle, while the aircraft was climbing and passing over the city of Osaka after takeoff. Regarding the departure of the Panel, it is highly probable that the Bracket that secured the Panel’s forward upper corner by holding it to the Aircraft’s side broke, a gap was occurred between the Panel’s forward upper corner and the fuselage, and the Panel departed due to the pressure of inflowing air and vibration.